And yet we do. I don't know why. Hobbes once said that we all do it because we are always inherently more interested in our own personal gain. People believe the actual quote is "man is inherently evil", but that isn't true. I think there is a lot of clout in the idea that people are first-and-foremost interested in their own lives and that of their children, than that of other people. Why I consider myself a Kantian, over other moral systems, is because it leaves room for the notion that we are firstly self-involved and then we apply logic to situations in order to discover the moral path. The people, who don't have that measure of balance, responsibility and restraint, are the people who lack the utility of a moral system. This is separate from narcissists, sociopaths, and Machiavellians. For instance, I am a narcissist. I won't argue that I'm not. However, I understand that the proper application of logic is required in order for proper moral interaction. While I'd love everything to be about me, it logically isn't. Thus, I'll get more use out of respecting other people's skills, than I will thinking I'm just better than everyone at everything. Ooo, there goes my spinning head [holds head in hands]... Didn't major in philosophy; only business studies. I can do a break-even analysis and tell you if a business is going to show a profit. Or devise a practical debt recovery strategy for aged debt. But the infinite workings of the human mind is a luxury I've not had the opportunity to spend much time on. Since you've brought it up, I've read up a bit on Immanuel Kant and Kantian ethics, and his system of transcendental idealism. But then I got sidetracked by Arthur Schopenhauer who expanded on Kant's approach to metaphysics. Schopenhauer appeals more to me in how he believes that nothing is without a reason for being. I'll have to read more and mull over what they both say for a while before I can make any coherent sense of it. Just an observation: you may be doing yourself a disservice with the definition of being a "narcissist". I've lived with one extreme example and worked with a few others. Which is why I have an ex and no longer work at a toxic environment. Most people will display a few narcissistic traits, but not to the extent of a full-blown clinical disorder. The occasional selfie, the need to preen or brag about some exploit (just a little) is understandably human and natural. I think a modest dose of self-love and self-awareness is healthy for our own preservation. It stops us from being too easily manipulated and exploited by more predatory types. The fact that you recognise the need for "respecting other people's skills" shows a degree of constructive social interaction. You acknowledge that it's not always about you. A true narcissist isn't capable of sharing the limelight or making room for anyone else's needs apart from his/her own. While I understand the need for people to look to their own interests first, it's the greed and excess that troubles me. When the wanting spills over into envy and covetousness. To wanting what others have and the deliberate ploys and scams to exert undue influence over others, so as to gain an ill-gotten advantage at their expense. I just want to have a clear separation between Kant's transcendental idealism and his take on morality. His book might be called Groundwork for the Metaphysics of Morals, but transcendental idealism (though I still tend to find it more practical than Schopenhauer's armchair philosophy) only seems to govern empirical objects and substance. This is something that morality is not. You have 2 individuals. Transcendental idealism deals with the empirical nature of each person, their surroundings and possessions. I.E. Their physical body, clothes, the knife in one's hand, the trees in your peripheral, etc. Between each individual, there is space. This could be 1 meter; it could also be 1 kilometer. Morality is how you choose to use that space, to interact with the other person at the end of it. If you choose to close the distance and stab them with a knife, that could be deemed an immoral act. However, if you choose to close the distance and cut them free of their bonds, you have another type of charitable act of morality. Surely, transcendental idealism and morality are connected, because you can't make a moral assertion or act without experiencing the empirical first. However, the decision you make only uses what information you gather from the objects. The act itself is governed by the application of reason, not to determine what the object is iherently (as T.I. aims to do), but to determine how to morally interact with it. As an answer to the narcissistic part of your reply, it definitely is the age where everyone will likely present with a narcissistic trait or two. Of course, that does not make you a narcissist. However, I should point out something, as believing some of the things that you pointed out such could open you up to being slow-played by a narcissist with a patient agenda. Respecting other people's skills does not need to be taken as a degree of constructive social interaction. It could simply be a way to keep in mind an alternate way of asserting dominance will have to be undertaken. Constructive social interaction, as with most interactions, can be facades to boost a narcissist in the eyes of individuals, without any invasive tactics. "Oh wow, you're right, I didn't think about that. But how about this as well?" and then people are singing your praises for the next week. Lastly, when acknowleding that it's not always about themselves, it isn't that they believe it shouldn't always be about themselves. It means that they need to go through a different means by which to make it about themselves again. This works best if they can achieve that organically. In other words, you don't want to tell people you're the best. You want other people to come to that realization on their own, and then tell you. Oh wow, you're right, Ka-Ra - you're the best! Thanks for clarifying about Kant's transcendental idealism and morality. Your illustration is clearer than the textbook dissertations that have been tying my brain into knots. What happens when perception enters the equation? Supposing the individual with the knife perceives the person at the end of the space a threat and reacts accordingly in 'self-defence'? And the other person likewise feels perfectly justified in responding the same way? Each individual would feel he/she is morally right. I suppose that's where the judicial system comes into play, to apply the moral yardstick. I've experienced the quiet narcissist with passive aggressive tendencies, as well as the outspoken and overtly attention-seeking ones. But I enjoy our interactions and what you've shared; it's fun to learn about different things. I've done one or two essays on the subject. The problem with a lot of philosophy text is that you need to read it through like 20 times. Each time is a different process of approaching it. It can be quite daunting and is probably the reason why so many people think philosophers are so long-winded. However, they say things very precisely. You just need to break it down. A professor of mine once said that if you can't explain it in a way that non-philosophy majors can understand, then you don't understand the text. As for your thoughts on perception, that's where it can get a bit cloudy. The idea is that you, as a moral agent, have certain moral rights and certain moral obligations to respect those same rights in others. However, just because a specific right hasn't been respected, that doesn't mean that an immoral act has taken place. To Kant, not only did the immoral action in question have to occur, but the agent needs to have committed the act, knowing it was immoral, with full intent of their immorality. Thus, you can actually get good people that do bad things, because they didn't know better. And you can get bad people doing good things for bad reasons. Though, the operative word here is reason. When it comes to each person's subjectivity, each could be justified (within their own capacity for reason) to consider it as an act of self-defense. They wouldn't be wrong, despite the fact that both of them couldn't be acting in self-defense, which means, at least one of the two people had fallen short on a very important moral obligation to develop their faculty of reason. Kant believes that we are all morally responsible for cultivating our capacity to reason, because reason is the cornerstone of morality. Should we not keep up with that obligation, it could lead to moments like you have described. Moments that result in tragic, yet not immoral consequences, are moments that show our immorality in not keeping logic up to snuff. Subjectivity. Added to that is the capacity for reason that is limited to each person's ability - or willingness to adhere to logic. When the logical facts are not palatable and become deliberately twisted to suit selfish needs. Everything becomes "fake" if it doesn't paint a pretty picture to that person's liking. History gets rewritten or whitewashed to present the victors in the best possible light. Or the vanquished present their view of history as being the innocent victims or the oppressed. Morality and ethical beliefs are thus wilfully discarded, and trampled to the ground. What can we do? Pull up a comfy chair, bring a jug of wine, a loaf of bread, fruit and cheese to the table. Let's discuss what the learned sages have said. I never much liked Kant. Maybe it was the density of his text… I do tend to prefer the poets, like Kierkegaard and Nietzsche… or the writers who expressed themselves through works of fiction, like Voltaire and Dostoevsky… but I generally have no real problem with dense text, per say. A Course in Miracles is written in the form of a graduate level textbook rather than typical scripture. Sure, I had to read most sections multiple times to grasp what it means, but the subject matter interests me. I think Kant is just too… ‘logic-dependent’ or ‘empirical’ for my tastes. Anyhoo, I haven’t participated in this thread thus far, as I haven’t felt I had anything to contribute, but I did notice one small thing that quirked my ears. That was you, Jadeite. Incidentally, hey yo Girly! There is a difference between feeling you are morally right and being morally right. I have no doubt that George Zimmerman felt he was morally justified when he murdered Trayvon Martin. I’m certain Mike Pence felt he was morally right, before the eyes of God, when he decided to separate children from their parents at the border. I believe K-Ra touched on this when he mentioned that Kant felt people had a moral responsibility to cultivate reason. But I also disagree with Kant here, because reason and logic don’t always lead to morality. Often, they simply lead to a justification of actions, with a pretense of morality. Take Mike Pence, above. I can guess his thought processes… the parents are criminals, as they entered our country illegally. Surely the children would be better off raised in foster homes by honest, God-fearing American (white) parents than by criminals. 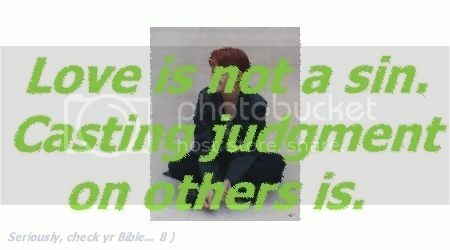 You look at a stranger, some distance away, and you make judgments about that individual. Maybe you feel threatened but feeling threatened is not the same as being threatened. The other may feel threatened as well. The real choice is not one of attack or defense… it is one of escalation or de-escalation. Pull yr knife to defend yrself or spread yr arms to show you mean no harm. And, there is always a third option… flee. I don’t know who it was that came up with the idea that ‘killing another human being’ was preferable to ‘my friends might think I’m a wuss’ but… yeah, total narcissism and cowardice. There’s even a 4th choice… to close yr eyes, say a prayer and let come what may. Where is it written that ‘death’ is the worst thing that could happen to a person? I am at peace with my Goddess. If I were to die from a car crash, or gunshot, or brain tumor tomorrow… I would die at peace. But, if I took another life before I died? Morality can’t be broken down into columns to be boxed off. I think, in the end, that is my problem with Kant… and Mill… and half a dozen others. You seem to be jumping half-in and half-out of morality being logical and subjective. "I think Kant is just too… ‘logic-dependent’ or ‘empirical’ for my tastes." "There is a difference between feeling you are morally right and being morally right." Unfortunately, the difference between truth (which is the sense of something being you speak of) and feeling lies in logic, which is fundamentally objective. The first thing I feel we need to straighten out is whether or not morality is subjective or objective. You can't have it both ways, unfortunately. In it's mind, it's helping. In reality, it's pedophilia. If I haven't made my thoughts about subjective morality clear: I think it's destructive to yourself, others, and society as a whole. Objective morality is superior to that, because it lays out fundamental principles that actually make things clear. Hypothetical Example: "You ought not to kill others, except in self-defense." Makes it super clear: Don't murder. However, don't let someone murder you. The not so clear, but still governed by the maxim: Vehicular manslaughter is immoral (you should have been more careful). Getting in a drunk fight and your opponent dying as an accident (manslaughter) is immoral (you shouldn't have been so careless with your consumption of alcohol). Objective morality really isn't all that hard to discover. When you enter the territory of "you just know what is immoral, because your body tells you and universe tells you", then you can easily fall into another moral trap, where you were immorally negligent, because you were waiting for a sign. There really is no escaping it, regardless of how much you dislike the idea. Hey Mika! Everything goes all sparkly when you're around. Grab a chair and your bottle of whiskey. We started out talking about energy readings, charismatic politicians with abilities to read and influence people, and influencers with questionable scruples. So the question became: just because you can do something, should you do it? Hello Ka-Ra, you got in ahead of me. Thanks for differentiating between objective and subjective morality. Regarding children, there's also the Stolen Generation in Australia, where Indigenous children were forcibly removed from their families between 1910-1970 because of government policies. The officials thought they were morally right at the time and applied logic and reason to validate their stance. Which still doesn't excuse the suffering they caused, the injustice of their actions, no matter how morally right they felt they were. Nietzsche: “There are no facts, only interpretations”. Perspectivism vs. relativism. Nietzsche felt it was is impossible for individuals to be perfectly detached and objective, because every ideal or philosophy is tied to some perspective. Whereas the relativism stance is that all views are valid because they're relative to the individual. (Btw I'm relying on either of you to expand on this for my edification). Which brings me to what I call 'middle-class morality'. (I know, I'm mangling Maslow's Hierarchy of Needs). A person begins with the survival stage, where all efforts are driven by hunter-gathering activities, no room for hesitation or moral doubts. Then comes the more stable stage, where the focus is on improving social status and quality of life. This is the 'middle-class' stage when the question is asked, is that right or wrong, should this deed be done? As for the higher level stage, it's all about reward and recognition. The temptation is to say that morality is only a concept and shouldn't stop an individual. How does ethics differ from morality? Can a person have a set of ethics that are morality corrupt? But I'd have thought that "ethics' by its very definition is a code of conduct for correct and lawful behaviour. Ok, I'm rambling now - lack of sleep will do that to you. I'm off to bed for now. Hopefully one of you (or anyone else) can jump right in. To be more clear, Kant… in general… is too empirical and logic based in his writing style. He doesn’t write with the poetic flair of Nietzsche or Kierkegaard so I never much got into his works. Or maybe I just read poor translations. My point was that I can’t even put up a pretense of knowledge about Kant’s philosophy. The problem I have with determining morality through logic is that there are, at least, three different kinds of logic. There is regular old logic, there is faulty logic and there is deceptive logic. Regular logic, in the sense you/Kant describe, I can get behind. Faulty logic would be what Kant describes as people who have not been diligent in honing their logic skills, whether through laziness or lack of opportunity. And deceptive logic would be, say, Hitler convincing Germans that it was moral to lock up and kill Jews, Roma and homosexuals. In the latter two instances, peeps might feel their morality is justified through logic when it is not. My issue is that I doubt many people can live up to Kant’s standard of logic. Now, my own personal belief is that everyone has an internal moral compass. Well, almost everyone. There are some people who suffer from mental illness. A psychopath would have a skewed compass and a sociopath none at all. But I believe that most people on the planet have a moral compass that points true North all the time. Call it yr conscience. And sometimes, we choose to ignore it… by convincing ourselves that there are extenuating circumstances or that doing something immoral ‘just this once’ would be ok, or even out of fear for our own well-being. And that is where ‘logic’ causes problems for us. If you ratted out a homosexual in the McCarthy era for fear of being falsely accused yrself… that may have bin a matter of self-defense, but it certainly wasn’t moral. If you turned in a runaway slave for fear of being seen as a conspirator in his escape, that may have seemed a logical thing to do back in the days of slavery, but it certainly wasn’t moral. Even for people who are capable of proper logic, the temptation for using faulty logic is too great to determine absolute morality. I also reject, out of hand, the idea that anyone who waits for a sign from God or the universe to tell them what is moral is following what I describe as an internal moral compass. You shouldn’t have to pray to know that separating children from their parents, when there is no sign of abuse or violent criminal intent on the part of the parents, is inherently evil. And the universe shouldn’t have to tell you that killing puppies for fun just isn’t cools. This is, in my opinion, another example of where faulty logic… ‘I prayed and prayed and God didn’t tell me not to do it…’ is the culprit. So, yes, I do believe that morality is objective. I just don’t believe it can be determined through logic in anything but the abstract or the rarest of real-life situations. I also feel we might be at an impasse. Because I don’t believe that one finds morality through signs or symbols and neither do I believe we find it through logic. I believe it is a gift given to us at birth… although, granted, we have to mature a bit to understand it… and when we fail, it’s because we think things through too much. Incidentally, Kierkegaard struggled with this dichotomy in one of my all-time favorite books, Fear and Trembling. Faith vs. logic. If you haven’t read it, it’s beautifully written… all kinds of poetical and stuffs… and the four retellings of the story of Abraham and Isaac are purely breathtaking.